Ice cream or Ice nondairy FROZEN DESSERT? It’s no doubt that the term ice cream or gelato is used when referencing vegan desserts, even though, as www.consumerreports.org reports, vegan ice cream is a misnomer. 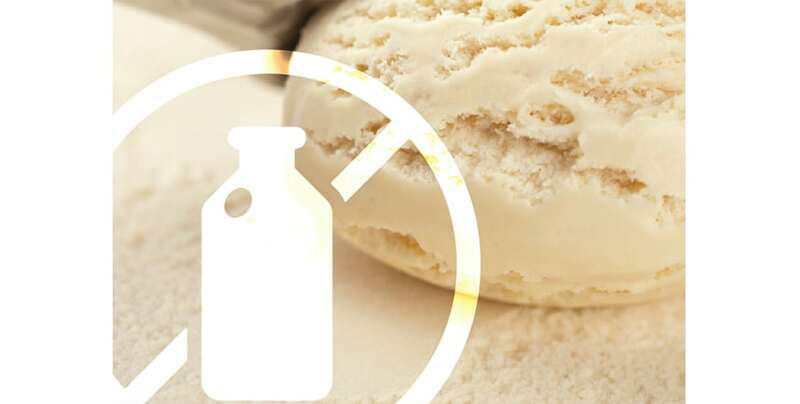 The consumer-focused website published that the Food and Drug Administration defines ice cream as a frozen, pasteurized product made from dairy that contains at least 10 percent milkfat. As a result, a similarly prepared dessert created with almond, coconut, soy, or other cow-less milk gets saddled with a clunky name like “nondairy frozen dessert.” So, the vegan industry gets to keep the trendy “ice cream” label while using vegan to explain that it is actually not ice cream at all. The vegan lifestyle has gained a lot of popularity in recent years. It may have been argued that veganism was a trend; one of which no one really knew how long it would last or how far it would expand. 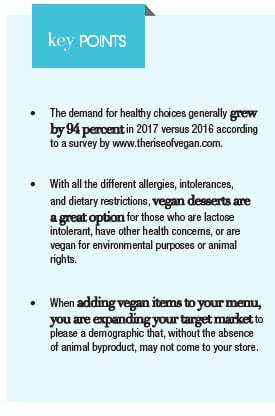 Whether or not you believe vegan desserts are a trend or not, survey results posted on www.theriseofvegan.com show that the demand for healthy choices generally grew by 94 percent in 2017 versus 2016. However, the question is, does vegan always mean healthier? Similar to how we are told that our brains play tricks on us, the vegan stigma leads us to believe that the lifestyle is always something healthy. When talking about vegan ice cream, vegan gelato, or any other vegan dessert, research from Mintel suggests that 25 percent of people think it has fewer calories or less fat or sugar than regular ice cream. What we need to remember is when you are talking about a dessert, you are talking about an indulgence. Are there indulgences out there that are made with no animal by-products, which can classify them as vegan? Absolutely. But there isn’t just nondairy milk being added to these desserts. There are plenty of high calorie ingredients that can go into a vegan dessert. Nutrition website, www.daveywaveyfitness.com reports that the list of ingredients is the determining factor in whether or not a dessert is healthy – and not simply the label of vegan. Nowadays, with all the different allergies, intolerances, and dietary restrictions, vegan desserts are a great option for those who are lactose intolerant, have other health concerns, or are vegan for environmental purposes or animal rights, but it’s not to say that vegan desserts are the healthiest out there. In spite of the fact that vegans and non-vegans can enjoy and appreciate a fruit-flavored sorbet purely because fruit itself is vegan, that’s not to say that those who opt for vegan desserts wouldn’t enjoy some vegan-friendly cookies and cream, too. As we have established, the fact that classifying the dessert as vegan does not always mean that it’s healthy, so what other reasons would you consider when looking to add vegan desserts to your menu? When adding vegan items to your menu, you are expanding your target market to please a demographic that, without the absence of animal byproduct, may not come to your store. So, shouldn’t every restaurant, hotel, gelateria, ice cream shop, etc. add vegan products to their menus? Money is a contributing factor. The old expression “you get what you pay for” holds true when talking about vegan desserts. Modifying recipes and substituting certain products can yield higher food costs. While whole foods such as fruits and vegetables are often less expensive, finding quality vegan dessert ingredients that won’t compromise your brand is not always easy or as cost effective as you may have desired. When stores dedicate themselves to the demands of a vegan market, the assumption could be that customers will spend more for a high-quality vegan dessert, which allows business owners/operators more margin to purchase the appropriate vegan ingredients, giving them their ultimate recipe for success. Veganism is a growing category in the food industry. It’s proven to have grown over the last few years with reported confirmation per www.riseofthevegan.com that six percent of Americans identify as vegan—up from only one percent in 2014. These kinds of statistics are just a glimpse into what researchers are predicting for the vegan lifestyle over the next few years. Although that percentage is still low, vegan foods and ingredients are definitely topics that need to be understood, because, at the end of the day, a dessert is a sweet treat to be enjoyed by all, vegans and non-vegans alike.